Jessica's Take: Goodbye, Head. Hello, Wilson! 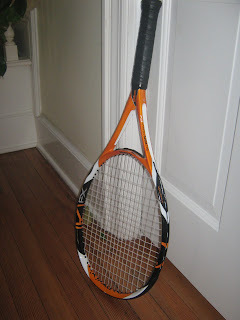 I just got a new racquet. It’s a Wilson K-Factor Zen Team. But more importantly, it’s orange. I am not a woman of color. Meaning, it’s taken me decades to even try on clothes that weren’t black, white or gray. My mother used to offer to pay me if I’d buy a non-black something-to-wear. But recently, I’ve been stepping out of my own accord. Moving to the suburbs helped. Once out of New York, I felt the freedom to experiment with a baby blue here, a raspberry there. One season I became totally smitten with a color the J. Crew catalog called “Lettuce.” They were talking Boston or Bib, not Romaine – a light green that practically screams springtime. I bought a sweater-set (of all things) and then stopped wearing it almost immediately. Every time I put in on, someone would ask me if I was coming down with something. Eventually I just passed it on to a friend and went back to buying nice, safe black. I’ve been trying out new racquets for three months. My tennis instructors choose demos for me based on my playing. I, on the other hand, tend to make choices based on the racquets’ names. I didn’t want a Wilson. Bo-ring. I wanted a Babolat. I’d played with a few red ones over the summer and then the Aero Strike since September. I would take the orange Wilson and a yellow Babolat onto the court and switch them out every few games. I didn’t really feel more simpatico with one over the other, but everyone I played with urged me toward the Wilson. “It’s your color,” they’d say. I showed up on the court this week with my new orange Wilson K-Factor Team Zen racquet and matching orange shirt. In fact I matched the racquet almost precisely with my white skirt and black wristwatch. Gina said I looked like Pumpkin Bisque, which I’m 99% sure she meant as a compliment. In fact, if I had bought myself those badass black tennis shoes that Shelley got last week, you’d barely be able to tell me apart from my racquet at all. But I could never wear black tennis shoes. Here’s the sad truth: I’m just not a good enough player to wear black.